Germany (German: Deutschland), officially the Federal Republic of Germany is a sovereign state in central Europe, bordered in north by the North Sea, the Baltic Sea and Denmark, in west by the Netherlands, Belgium, Luxembourg, and France, in south by Switzerland, and Austria, in east by the Czech Republic, and Poland. Additionally the country shares maritime borders with Sweden, and the United Kingdom. 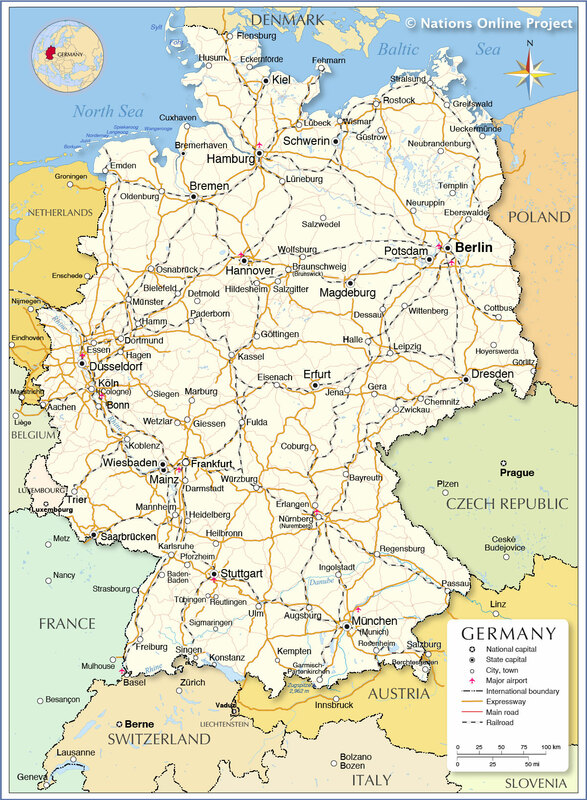 With an area of 357,022 km² Germany is the seventh largest country by area in Europe, compared it is about two-thirds the size of France, or slightly smaller than the U.S. state of Montana. Germany has a population of 81.7 million people (2015); capital and largest city is Berlin with about 3.3 million inhabitants. There are three major natural areas making up the topography of the country. The North German Plain, a widespread lowland in the northern third of the country, Schleswig-Holstein and Lower Saxony with Bremen and Hamburg, Mecklenburg-Western Pomerania with its many glacier-formed lakes, and Berlin within Brandenburg, most of Saxony-Anhalt and parts of North Rhine-Westphalia and Saxony lie within the North German Plain. South of the northern lowland there are the Central Uplands, in Germany known as Mittelgebirge. The large, fertile area of low mountains, hill ranges, and ridges are covering the better part of Germany. These in parts densely wooded range of hills are found in Thuringia, Hesse, the Saarland, Rhineland-Palatinate and Bavaria. The elevations of the Mittelgebirge range between 300 m and 1493 m, the height of the main peak of the Feldberg, the highest mountain in Germany outside the Alps, located in the Black Forest in Baden-Wurttemberg. The broad strip of land between the Danube and the northern edge of the Alps in Germany's southern border area is known as the Alpine Foreland. In the country's southern-most part are the Bavarian Alps, the northern part of the Alps that lie within Bavarian state territory. It is also the location of highest point in Germany, the Zugspitze with 2,962 m, the highest peak of the Wetterstein Mountains. Map is showing Germany and the surrounding countries with international borders, the national capital, state capitals, major cities, expressways (Autobahn), main roads, main railway lines, and major airports. For more information about a city, including a searchable map, click on the name of a state capital/city. Largest Cities (pop. 2013) after Berlin (pop. 3.3 million) are: Hamburg (1.8 million), primary port, Germany's "Gateway to the World". Munich (München, pop. : 1.42 million), capital and largest city of Bavaria, founded in 12th century by Benedictine monks. Cologne / Köln (1 million), a major center of art, trade and carnival; founded by the Romans in 50 AD. Frankfurt (Main, pop. : 690,000), largest city in Hesse, known as the leading financial center in continental Europe. Stuttgart (613,000), capital of Baden-Württemberg, known as Schwabenmetropole (Swabian metropolis). Düsseldorf (600,000), state of the art culture, fashion, and business. The cities of Dortmund, Bochum, Essen, and Duisburg in the Ruhr region form the fifth largest urban area in Europe. Aachen, Augsburg, Baden-Baden, Bayreuth, Berchtesgaden, Bielefeld, Bonn, Braunschweig (Brunswick), Bremen, Bremerhaven, Chemnitz, Coburg, Cottbus, Cuxhaven, Darmstadt, Dessau, Detmold, Dresden, Eberswalde, Eckernförde, Eisenach, Emden, Erfurt, Erlangen, Fehmarn, Flensburg, Freiburg, Fulda, Garmisch-Partenkirchen, Gera, Giessen, Görlitz, Göttingen, Greifswald, Güstrow, Hagen, Halle, Hamm, Hannover, Heidelberg, Heilbronn, Hildesheim, Hoyerswerda, Husum, Ingolstadt, Jena, Karlsruhe, Kassel, Kempten, Kiel, Koblenz, Konstanz, Köln, Leipzig, Lübeck, Lüneburg, Magdeburg, Mainz, Mannheim, Marburg, Münster, Neubrandenburg, Neuruppin, Nuremberg (Nürnberg), Oldenburg, Osnabrück, Paderborn, Passau, Pforzheim, Potsdam, Regensburg, Reutlingen, Rosenheim, Rostock, Saarbruecken, Salzgitter, Salzwedel, Schwerin, Siegen, Sigmaringen, Singen, Stralsund, Stuttgart, Templin, Trier, Tübingen, Ueckermünde, Ulm, Wetzlar, Wiesbaden, Wismar, Wittenberg, Wolfsburg, Würzburg, Zwickau.